Norman Rockwell, The Ticket Seller, 1937, oil on canvas, 25 x 24 inches. Cover Illustration for The Saturday Evening Post, April 24th, 1937. Private Collection. The Ticket Seller by Norman Rockwell was illustrated as a cover for The Saturday Evening Post published on April 24th, 1937. The painting depicts a man in a Ticket Agency surrounded by posters advertising travel destinations in Europe and around the world. Some of the destinations listed are “Paris,” “Mountains” and “The Orient.” Bars block the ticket seller’s desk as if he is imprisoned in a jail. The lighter, vibrant colors surrounding the advertisements are contrasted inside the cell by the dark colors surrounding the ticket seller. The ticket seller’s expression of sorrow and boredom mimics the colors that surround him. 1937 was a tumultuous year in American history. After the Stock Market Crash on Black Tuesday, October 29th, 1929, the country suffered an economic depression. The Great Depression in the 1930s was characterized by massive job loss and economic decline in the United States. The Speculative Bubble contributed to the severity of the Depression because of the emphasis on mass investing and loans. Although The Great Depression affected the whole country, it impacted New York in uniquely. New York, a symbol of the American Dream and capitalism, collapsed under the economic pressure. The Great Depression experience in New York City did not encapsulate the average American experience and therefore would not have been at impactful of Rockwell to depict. Rockwell depicts a ticket seller from a small town because of its relatability. For Rockwell, the impact of his paintings relied heavily on understanding the audience he reached and what would prompt them to have a reaction. His artwork had a national reach, so it was important to him to connect with people all around the country. One of Franklin Delano Roosevelt’s goals for his presidency was to lift the country out of The Great Depression. He achieved this goal through the New Deal, a series of economic agencies and policies that created jobs and poured money into the American economy. The Works Progress Administration (WPA) is one of the most famous of these programs because it created jobs for artists to both document the time period and create art and murals throughout the country. The projects and policies of this time period helped to build the infrastructure of the nation’s largest cities and towns. Despite all of the struggle, the nation and, more specifically, Roosevelt continued to support the arts by creating the WPA. At the start of the Progressive Era (1890-1920) and the Gilded Age (late 1800s), more Americans were interested in traveling, and it became a more profitable business. Banks saw it as a good investment because they could charge fees for helping customers. With the Depression, many of these travel agencies and banks were closed because of decreasing disposable income, which had become symbols of the relative wealth of the previous decade. However, towards the end of the 1930s, it appeared that the economic “storm clouds” of the Depression were clearing, and that an increasing number of Americans had money to spend, including on travel and vacation. The country had started to see the effects of the New Deal coupled with increase in armament production in support of the Allies involved in World War II, and they aspired to return to pre-Depression habits typical of the average middle class American family. The Saturday Evening Post greatly influenced American political views after its creation by Robert S. Coffin and Charles Alexander in 1821. Rockwell’s paintings in the 20th century were not only evocative of the time, but also influential because so many people viewed both the paintings and articles accompanying them. Similar to the work of the WPA, Rockwell’s work with The Saturday Evening Post helped both lift the spirits of Americans and inform them. Typically, Norman Rockwell’s artwork shows an idealized American society, while also accurately depicting its downfalls, but The Ticket Seller stands out from his other work. The Ticket Seller is unique for an illustration published during The Great Depression as it depicts an activity related to travel, something very few Americans at the time could afford to do. 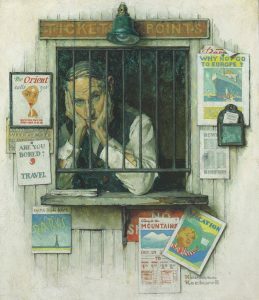 The Ticket Seller differs from many of Rockwell’s paintings because it depicts some of the effects of the Great Depression and is not uplifting, but more complex. The painting itself is unpatriotic with its lack of emphasis on the greatness of the U.S. and dull colors; it makes the viewers feel as if they want to leave the U.S. By advertising travel, it promotes the idea that there are better places to live and see than the United States. This pessimism contrasts many of Rockwell’s paintings that glorified American daily life, and was especially controversial because the intended audience for this illustration was not the same as the intended audience of The Saturday Evening Post. Rockwell’s painting was not received well by the editor of The Saturday Evening Post, who was an anti-New Deal Republican. He thought that what The Ticket Seller reflected did not apply or relate to a majority of the country. 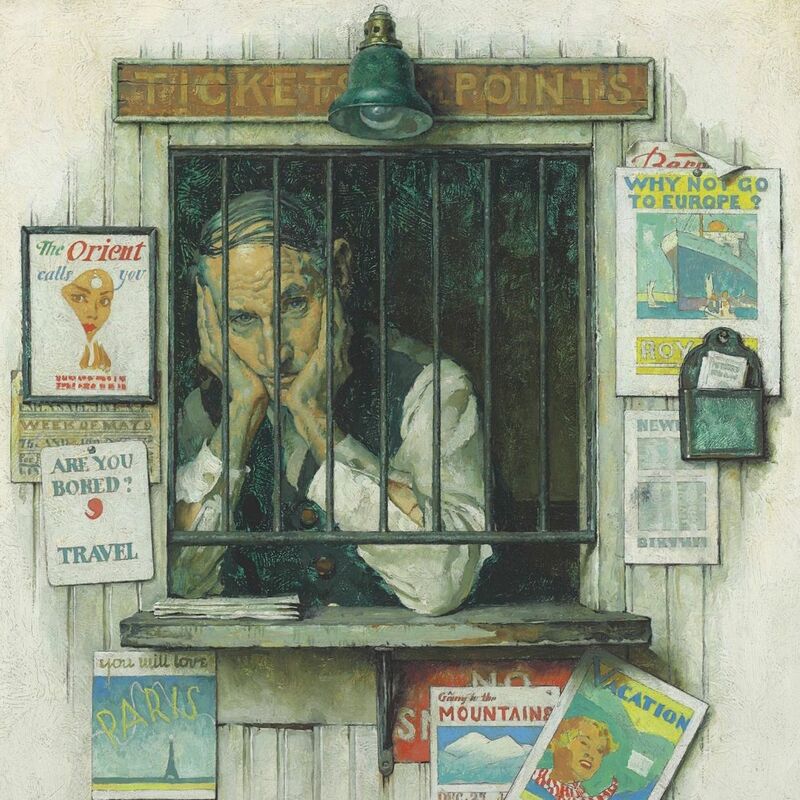 The Ticket Seller depicts a man who is trapped by The Great Depression and unable to attain the American Dream. His small town job as a travel agent showed him the freedom that was possible, but did not give him the means to access it. In The Ticket Seller, the advertisements and bars that enclose his desk show the ways in which he is trapped, and emphasize the effects of the economic collapse on the average individual. The political and social climates of The Great Depression were ones of sorrow and anxiety, and this painting illustrates how the average American responded to these emotions. Although the ticket agent is lucky enough to even have a job, he does not feel fulfilled by his work and is trapped by his economic standing. This painting contrasts Rockwell’s later depiction of Freedom From Want, which displays a family having a Thanksgiving meal. From Rockwell’s work in The Great Depression to Rockwell’s work during the war, it becomes much more patriotic and depictive of the beauties of American life instead of its downfalls. Babcock, Frederic. “Winter Travel Business to Be Greatest in History.” Chicago Daily Tribune (Chicago, IL), December 9, 1934, Resorts Travel-Part 4, 45-46. https://search-proquest-com.spenceschool.idm.oclc.org/docview/181563760?accountid=13992. Bennett, Lennie. “An American Icon Unveiled.” St. Petersburg Times (St. Petersburg, FL), March 30, 2008, Local/Regional, L6. https://search-proquest-com.spenceschool.idm.oclc.org/docview/264207567?accountid=13992. Boucher, Justin M. “American Genre Painting in the Nineteenth Century: Teaching Artistic Interpretation as a Tool for Critically Viewing History.” Yale National Initiative. Accessed July 10, 2018. http://teachers.yale.edu/curriculum/viewer/new_haven_04.03.01_u. Duffus, R.L. “New Dawn in the Great Valley.” The New York Times (New York, NY), 1933, SM1. https://search-proquest-com.spenceschool.idm.oclc.org/docview/100567146?accountid=13992. Litt, Steven. “Artwork Testifies to Gloom and Hope Sense of Place.” The Plain Dealer (Cleveland, OH), February 9, 2014, sec. C, 1. https://search-proquest-com.spenceschool.idm.oclc.org/docview/1496286698?accountid=13992. “Saturday Evening Post (1839-1885).” American Periodicals Series II, November 20, 1875, 4. https://search-proquest-com.spenceschool.idm.oclc.org/docview/126543010?accountid=13992. Slate, Ben Davis. “Book Review: Norman Rockwell, Reconsidered.” The Salt Lake Tribune (Salt Lake City, UT), November 8, 2013. https://search-proquest-com.spenceschool.idm.oclc.org/docview/1449396890?accountid=13992. Stocks, John. “Bank Travel Bureaus and the Future.” Bankers’ Magazine, July 1932, 31-33. https://search-proquest-com.spenceschool.idm.oclc.org/docview/124366240?accountid=13992. Vorderbrueggen, Lisa. “Economic Stimulus — Then and Now.” Oakland Tribune (Oakland, CA), April 6, 2009, Politics. https://search-proquest-com.spenceschool.idm.oclc.org/docview/352402578?accountid=13992.